Sometimes I noodle around with my Canon S95 or my iPhone while I’m watching TV. I’m not sure why I do it, but I have captured my TV screen dozens upon dozens of times. I think I’m fascinated that my digital camera can capture a crisp image off my flat-screen TV. One evening I was watching some 1960s spy flick. I forget what it was called. 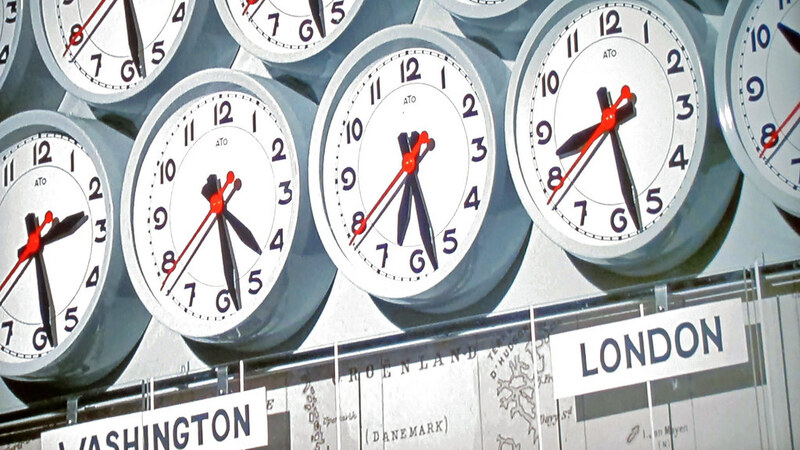 I liked the look of these clocks. Because I wasn’t sitting right in front of the TV, the original photo shows my entire TV screen at a wacky angle. So I set my crop to 16×9 and expanded it to capture as much of the movie image as it could but leave everything else out. This image is my computer’s desktop background right now. That’s remarkable for a photo from a TV. Whenever I see one of these clock arrays I am reminded of how they had such a thing at the TV station where one of my uncles worked. I can remember as a kid being amazed by all these different times from all over the world. I think back in those days such a display was meant to show how an organization was on top of all that was going on in the world. We actually have a small clock array where I work — a clock for Indianapolis, plus two more. I forget what cities. One of our customers is in Austria, so it’s good to know what time it is there so we don’t do system maintenance during their normal business hours. But yes, there is a sense of “look how on top of the world we are” when you see one of those giant clock arrays. I always loved taking pictures of the TV (or trying to)! It wasn’t so easy back in film days with flickery CRT screens. One time as a kid I bought a roll of Kodachrome 64 (which at the time I thought would force my cheap point-and-shoot to use a 1/60 shutter speed) just for the purpose. I never had any luck photographing CRTs so when I got this LCD or LED or whatever it is set a couple years ago I kind of went nuts because there’s no flicker to get in the way. I’ll bet, however, that my S95 could grab a CRT image if I set it right. Nice! I have never been able to get any sort of decent photograph off of a TV screen. It helped that this scene was still. Motion is very hard to freeze.